Isuzu Philippines Corp. is making it easy for everyone to own a brand new Isuzu vehicle. 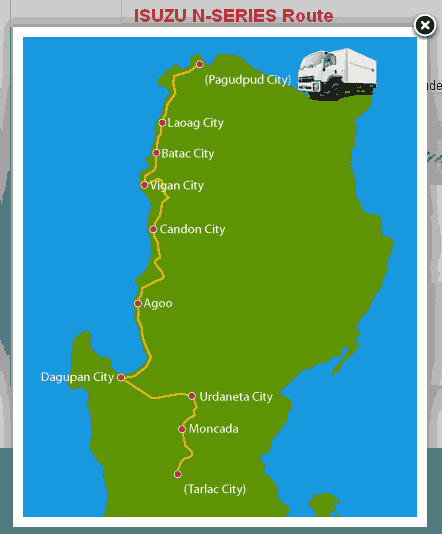 Simply guess the exact distance--right down to one decimal point--an Isuzu vehicle can travel on a tank full of diesel from a starting point in Pagudpud to wherever it runs out of fuel. The Isuzu Farthest Mission contest aims to show the fuel efficiency of Isuzu vehicles. The first round will run from May 26 to 29 and the winner gets an Isuzu NHR truck by guessing the exact distance it will travel in kilometers down to one decimal point. If a commercial truck isn't to your liking, you can also win an Isuzu Crosswind for the second round slated on July 14 to 17 or an Isuzu D-Max pickup for the third round on October 20 to 24. Entries for the first round are accepted until May 25. Entries for the second round will be accepted until July 13, and for the last round on October 19. To join, visit www.isuzudieselmission.com.ph to register and submit an answer. The promo is open only to participants 18 years old and above. The Isuzu Farthest Mission promo is only one of four components of Isuzu Philippines' diesel-awareness campaign for 2010 which will showcase Isuzu's superiority in diesel technology. The other three components are the Isuzu Dura-Mission, the Isuzu Eco-Mission, and the Isuzu Dyna Mission.